Alma's conversion is documented in three places in the Book of Mormon. 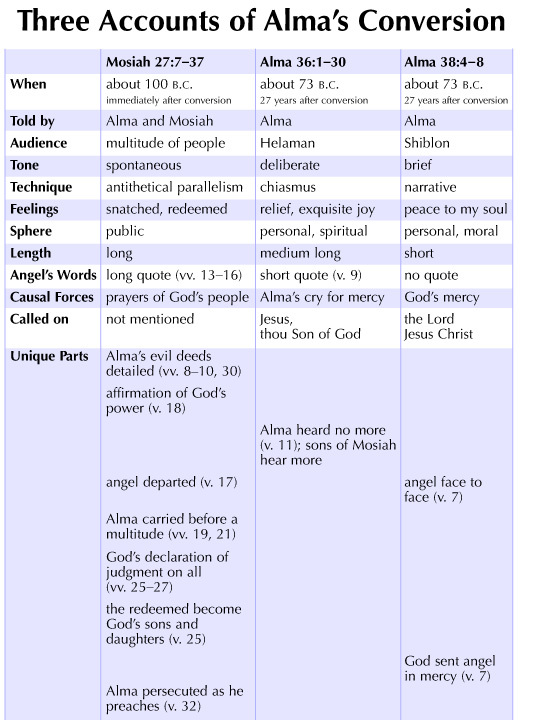 This chart compares the rhetorical situation of each of these accounts and shows how the context of the situation may have in part determined the way Alma expressed his conversion story each time he told it. For example, Alma's initial account of his conversion (see Mosiah 27:7–37) is spontaneous and detailed, perhaps because it had just occurred and was still very vivid in his mind. In this account, he uses direct, antithetical parallelism to emphasize that the atonement had miraculously changed him from one former state into a new person. Alma's account to his son Helaman (see Alma 36) is the longest and most elaborate. This is perhaps because Alma gave this account in a blessing to his first son. To emphasize his pivotal acceptance of Jesus Christ as the Savior—the turning point in his life—Alma expresses his conversion story in the form of an extended chiasm. Alma's narrative account in Alma 38, given to his second son, Shiblon, is much shorter. Alma focuses on the mercy of Christ in this account and counsels Shiblon not to "boast" in his wisdom or strength. Though each account differs from the others, all were appropriate for the contexts in which they were given.